The Schaumburg Township District Library is happy to announce a new exhibit “Greeting Cards of the 50s” for your viewing pleasure. Thanks to the Lichthardt family, the library is able to display a portion of the collection of greeting cards received by William and Martha (Kruse) Lichthardt at their home during the 1950s. The cards were received for many occasions: Christmas, baby announcements, Mother’s Day, Father’s Day and even on the occasion of their silver anniversary. Their story began when William was born on January 30, 1888 to Fred and Sophia Licthardt. Martha was born the same year on August 16, 1888 to Henry and Sophia Kruse. They were married on November 4, 1909 at St. John Lutheran Church in a German service on Irving Park Road in the southern part of Schaumburg Township. A reception was held before and after the wedding at the groom’s parents’ farm at Barrington and Irving Park Roads. The tent for the reception was borrowed from the Addison Orphan Home as were the dishes. The menu consisted of beef, potatoes, homemade cakes and bread, rice with sugar and cinnamon, prunes and peaches. The luncheon was served in the afternoon. Their married life began on the same farm and they later had three boys: Wilbert, Harvey and Melvin. By the time these cards were given to them, Martha and Bill were living in Elgin. They celebrated their 50th wedding anniversary in 1959 and Martha died two months later on January 30, 1960. Bill died 11 years later on October 2, 1971. The display is near the Reference Desk on the Second Floor of the Central Library at 130 S. Roselle Road. Stop by and see it! 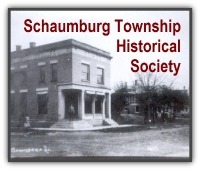 Through the months of June and July a new exhibit on the second floor of the Schaumburg Township District Library will commemorate J.H. Redeker Peonies, a business begun in 1927, whose remnants exist today on the grounds of Spring Valley Nature Center. Photos of the original fields and the Redeker family cultivating the peonies will be on display. In 1927, John Redeker, son of Friedrich and Wilhelmine (Boeger) Redeker, used some of his mother’s inherited Boeger land to start a wholesale peony flower and root business called, simply, J H Redeker Peonies. Around the same time, he also built an Adirondack-style cabin for himself. This cabin and remnants of the peony fields are now part of the Spring Valley Nature Sanctuary at 1111 E. Schaumburg Road in Schaumburg. Unfortunately, John died suddenly on December 29, 1930 at the age of 30 and the business survived for only a short time afterwards under the care of his mother and his aunt Wilhelmina (Boeger) Fasse. Despite John’s death, the demise of the business was imminent. Peonies grown in the St. Louis area were available one to three weeks earlier and could easily be shipped to the Chicago area by truck. Starved for spring, florists, hotels and other large consumers in Chicagoland would have leapt at the chance to use and display the peonies at the earliest possible date. The longevity of the peonies and the relatively, minor disruption to the land allowed some of the plants to survive for these past 84 years. To view the Redeker peony fields at Spring Valley, approach from either the Vera Meineke Nature Center on Schaumburg Road or the Volkening Heritage Farm on Plum Grove Road. In commemoration of this short-lived but unique business, your neighbors in Schaumburg Township have submitted photos of the beautiful flowers in their yards and at Spring Valley for this display. Take a walk through their gardens and enjoy those blooming peonies!